Nothing matches Lora Leigh’s latest entry in the series about genetically altered Breeds with feline DNA—and the humans who awaken their desire. Love this series. Loved Megan's Mark: story and performance. But I could barely finish Mercury's War. Story was great, but the narrator (the same one for Megan's Mark) sounded like she was a novice at times. Dialogue is well played, with feeling. The rest had a strange rhythm and pitch changes throughout. And some of these male breeds sound too much alike. What happened?? I heard none of these problems while listening to Megan's Mark. I'll try the next book because I like the series and the narrator CAN do a good job. Just not sure what happened here. I really enjoyed this story, held my interest and it gave me a reason to continue the series. mercury is so hot! what a great story and am now onto another in the series. happy days! 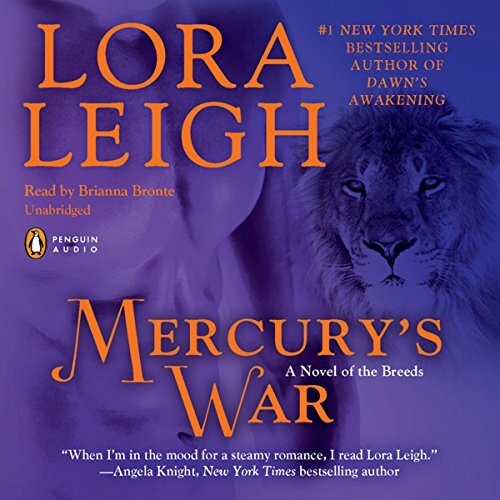 Where does Mercury's War rank among all the audiobooks you’ve listened to so far? It's a nice read, but not one of my all-time favorites. Not sure. I can probably relate to Ria a lot. Which character – as performed by Brianna Bronte – was your favorite? Again, I'm not sure. I usually like Dane a lot, but his South African accent came and went more than I liked. No, it's too long to listen to all at once. It's been a little bit since I listened to this one, but I think I recall that some of the character voices just didn't ring true for me. But that could just be personal preference. I have enjoyed this whole series, and this is my favorite so far. A lot of strife and drama along with the usual breed heat. Two outsiders find love in each other. Would you try another book from Lora Leigh and/or Brianna Bronte? I loved that Ria was fighting with herself, but still able to defend Merc. Make you Smile,laugh and cry. If you could sum up Mercury's War in three words, what would they be? What was one of the most memorable moments of Mercury's War? When he realized that Ria was his mate. To me so far this book and the first are the best. Awesome reading!! She is fabulous. Have you listened to any of Brianna Bronte’s other performances before? How does this one compare? yes. they are all good!! Would you listen to Mercury's War again? Why? I was less than impressed with the narrator. The male 'voices' sounded as if they were grumpy old men rather than strong males in their prime which really struck a very discordant note throughout the book. She did a somewhat better job on the female voices.